Todays post is one totally for fun! I mean not only am I using Stampin' Up! brand supplies, but I am playing around some fun retired products that I still love. 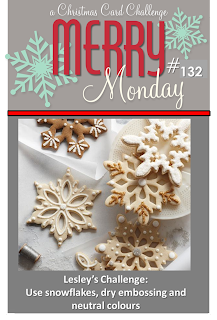 The project is for the challenge over at Merry Monday Christmas! They really have some fun themed challenged, and like playing along when I get the chance. This one, however, I couldn't pass up. The other fun part, is that I challenged my good friend, Breelin Renwick at Craft-somnia Momma to play along with me. Make sure you go visit her, to see what she created! I have three favorite retired items that I am using. Number 1 is the stocking big shot die. Number 2 is the lattice embossing folder. Number 3 is the festive flurry stamp set and matching framelit set. My mother loves antique and vintage looking things, so this is perfect to slide her gift card in for one of her Christmas gifts. Yes, I said gift card holder. You see when you lift the stocking top up, there is a pocket that you can slide a gift card in. My plan is to attach it like a tag to the outside of her other wrapped package. I love everything about my stocking, but I real fun element, is the little mini punched stars that dangle on natural twine from the large snowflake cluster. Inside showing where the gift card or cash can be slid inside. I stamped the snowflake in baked brown sugar ink, and cut out a champagne glitter snowflake to layer in behind. I also stamped the sentiment of "merry and bright" from the Good Greetings stamp set. I hope you have enjoyed my challenge project. Leave some "love" as I always enjoy reading your comments on my projects. Gorgeous! Love every detail and the retired products you used. Thanks for playing at Merry Monday. Great project I love all the details and these are three of my favorite retired products as well. Stunning!!! Wonderful project, I love the great details. Thank you for joining us for Merry Monday. Love your stocking with the vintage paper! Great design! This is so much fun! I love how you incorporated all the challenge requirements into this great shaped card! Thanks so much for joining us at Merry Monday. Wonderful idea! Love that pretty stocking!